Does anyone have experince with being able to pair and second mavic controller to the Mavic 2 Pro? According to the manual (page 47) it is coming in a future firmware version. Some managed to get it bond but its not officially supported yet - so wouldnt try. Hi there, thank you for reaching DJI forum. As of the moment, it is not yet officially supported but it is coming soon. Please refer on the attachment below, thanks for your support. Yes, dual operator mode is coming soon. Also heard some rumors the Mavic Pro (previous generation) remote controller can operate the Mavic 2 with dual setup wit a future software update. Exciting if they release the option soon. Yes, dual operator mode is coming soon. Also heard some rumors the Mavic Pro (previous generation) remote controller can operate the Mavic 2 with dual setup. Hello there. Actually no. currently, Mavic Pro remote controller is not compatible to use to Mavic 2 series. Please stay tuned to our website for future updates. Thanks for your support. My apologies that&apos;s not completely what I meant, edited my earlier reply now. But could it be possible the Mavic Pro remote controller could control the M2 with a future update? Hi, thanks for the clarification. We will forward your query to our Senior engineer for further updates. Thanks for your understanding and please stay tuned. Its been two months since the term soon was used, now we should at least have a timeframe for when its available. Could you please check with your r&d department, so we know? 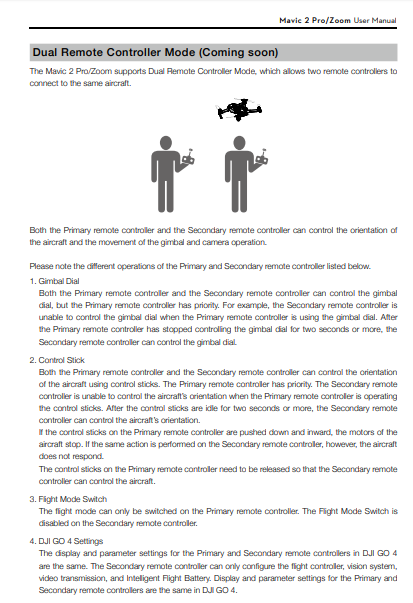 DJI&apos;s latest manual for the Mavic 2 series 1.6 has removed any reference to Dual Controllers. No longer "coming soon!" It may not be coming at all. Hi, thanks for reaching back. Unfortunately, we haven&apos;t received any update regarding this matter. Don&apos;t worry. I will follow up this query to our R&D Department for further clarification. Thanks for your understanding. are there some news about the dual-modus? The Dual controller discussion is REMOVED from the most recent manual. This feature was "Coming soon" according to the Mavic 2 manual last summer (page 47). In the new version that page has been removed, and there is no mention of dual controls anymore. Some news about the dual modus ? I would like to know as well. How about DJI? Yes. As the model is called Pro that would indeed make sense. Whilst the 2 Pro is not going to replace an Inspire 2 it is nevertheless used in Pro applications on occasions. Dual controllers would make operation more efficient (and give DJI excuses to sell more controllers). DJI, there are many Mavic 2 pilots that have been awaiting the release of Dual Remote flying feature. You removed reference to this capability on v1.6 of the user manual, however numerous responses over a variety of forums state that this feature still intends to be available through software release.. Some months have since passed..
DJI, is there a further update from R&D over the software release of Dual Remote flying? Agree. A drone with a &apos;Pro&apos; suffix should have dual r/c support. Still nothing on this. Just got waypoints tho... soooooooo Soon I guess. lol. I now have two controllers for my Mavic 2 Pro, and when I went to connect, as I had seen a video of how to connect on the Mavic pro, I realised that there was no way to add a primary or secondary controller as with the predecessor drone. I can&apos;t describe how disappointed I am with this, as it is called a &apos;pro&apos; drone. The autonomous programmes are good, but do not meet the needs for many other creative situations. Is there any news on when the Mavic 2 drones will have this capability, as it&apos;s just an amateur drone without this capability?? Very disappointed. any news about dual support on mavic 2? According to last FW update - 1.00.04.00 - yes, it is possible from now. Right now I updated and have no second RC for test, but will be tested tomorrow . Hello! Please, tell us if now you can have the "pilot vision" on one controller and the camera on other. Does anyone know if the Mavic Pro (first version) works as a secondary remote for the Mavic 2? and What about the Smart Remote? I only have two hands - how do I use two controllers!